Everyone has an ‘old faithful’ restaurant that they know they can rely on for a good night out. The House in Brighton is that for me. Each time I go there, I am always left feeling full, satisfied and extremely happy! 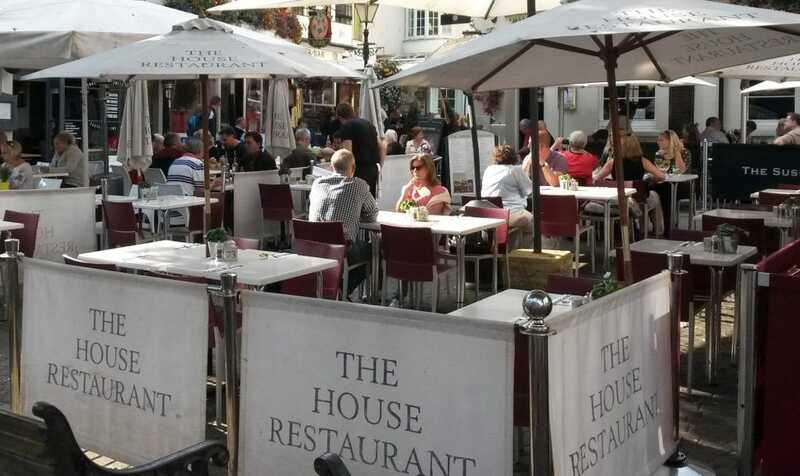 Independent, family run bistro, the House is tucked away in the corner of East Street in Brighton. Not needing to shout out from the rooftops that they are there, as their long standing, well deserved reputation does that for them well enough. It’s not just the outstanding food that brings me back, it’s the atmosphere and the warm welcome I receive too. Like the name, it has the feel of home, but with the feel of eating out and being spoilt at the same time. Not something that many restaurants can quite pull off. My most recent visit was inspired by my husbands complaint that we were eating too healthily and that he needed a good steak dinner! I could lie and say that it was the thought of spending a romantic evening with his beautiful wife, but no, it was the thought of spending the evening devouring a big, juicy steak! Fair enough I thought. I’m certainly not one for turning down such an opportunity. And we had been eating our fair share of healthy homemade meals lately. We deserved it. It was a lovely summer mid week evening and when we arrived, there was already quite a few people sitting on the terrace outside. As pleasant as it looked, I fancied cozying up in a corner of the restaurant soaking up the atmosphere. For a Wednesday night, it was buzzing. On the ground floor where we were sat, there was a couple who looked like they were on a first date, a family of four celebrating a birthday and a larger party who seemed to be celebrating life! All there for different reasons, but everyone seeming relaxed and happy. Already knowing we were both ordering steaks, we looked at the menus and perused the starter section. Every elegant starter made my mouth water. There was a selection of both traditional, unfussy favourites and more unique, interesting ensembles. Deciding to balance out our meat focused mains, we both went for a fish starter. 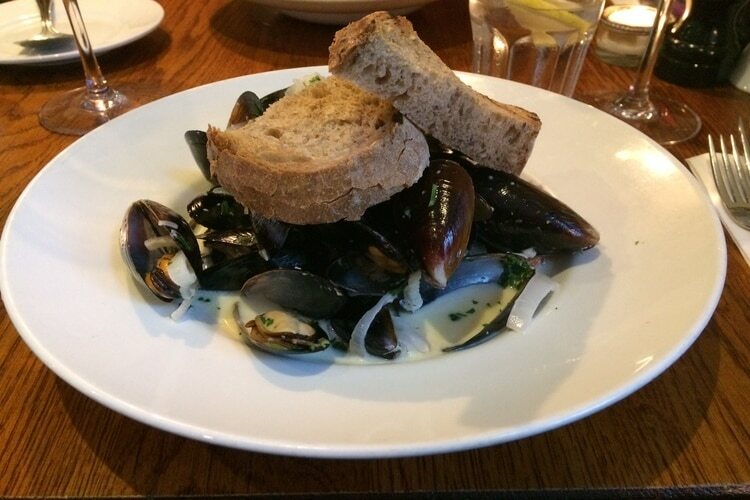 Tommy played safe and went for the much loved Moules Mariniere simply cooked with white wine, garlic, parsley and a dash of cream. 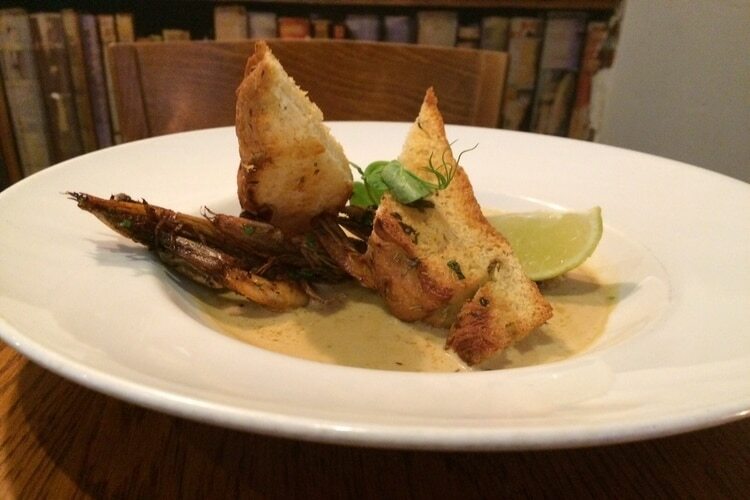 Feeling a little more exotic, I opted for the Pan Roasted Garlic Tiger Prawns in a chilli, lemongrass, ginger and coconut broth with garlic focaccia. Due to a technical error, there was a slight delay on our starters arriving. Our waitress came and spoke to us straight away to let us know. This goes a long way in my book. Errors will always happen, the important thing is to communicate with the customer and keep them informed. 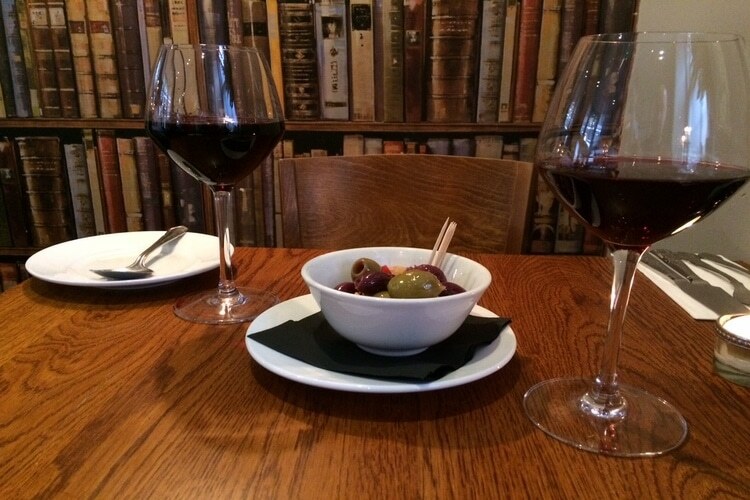 We were quite happy to sit there and enjoy our wine whilst taking in the relaxed, cozy ambience. We’d both gone for red to go with our steaks. A voluptuous Malbec for me and a lighter, elegant Pinot Noir for my strapping husband Tommy. Both wines were superb and went down like a treat. Our starters arrived with a big smile from our waitress, as if she was confident that they would be worth the wait. She was right. Both dishes were sensational. Perfectly cooked and perfectly portioned, they warmed up our taste buds like nothing else. The prawns came with a small piece of salty, garlicky focaccia which was so soft and fresh it was like eating cake. It was incredible for mopping up the last creamy drizzle of coconut broth. Heavenly. 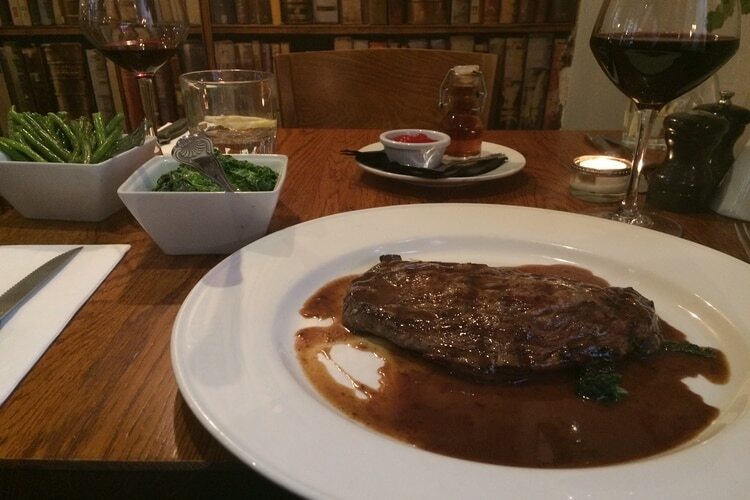 With such an impressive start, our anticipation built for our steak mains. As the House is known for it’s steaks, there is a wide and interesting selection to choose from. Ranging from the simple but elegant Parisian steak served with a delicate bearnaise sauce to the bolder Steak Benedict served with root vegetable puree, crispy black pudding, rash of streaky pancetta and a poached egg. We both decided to go for something in between, and dare I admit the exact same steak we both went for on our last visit. A lover of variety and a bit of a risk taker, it is rare for me to order the same thing twice. It is however a huge compliment to the chef if I do. The House Classic Ribeye is just a dish I can never resist. Topped with crispy homemade onion rings, Brighton Blue cheese and a port reduction, what more could you want in life? Steak and blue cheese is a combination that gets me every time. Tommy likes a bit of a kick with his steak and usually goes for the Pepper Ribeye with a rich green peppercorn and cream sauce with a hint of cognac. This night was no exception. With a slight sense of guilt for succumbing to familiarity once again, I consoled myself that we had tried new starters, and that next time, I would definitely choose something new on the mains. Well, almost definitely. As our steaks were placed on our table and the sight and the smell reached me, my resolve started to melt like the blue cheese on my plate. As I bit into a mouthful of the juicy steak with a lump of soft, gooey blue cheese and a strip of crispy onion ring, my resolve all but disappeared. If something tastes this good, how can it be wrong? Both opting for chunky chips to accompany our steaks, we also went for some green veg on the side. The green beans came in a bowl, absolutely dripping with salty, garlicky butter. Who knew green beans could be so good?! They were cooked al dente and had a lovely springy crunch to them, just how I like my veg. Once our empty plates were taken away from us and we were given a few moments to enjoy that satiated feeling, the waitress came over with a smile on her face and the dessert menus. Raising her eyebrows, as if to challenge us she put the menu down and left without uttering a word. She could probably sense that we were seasoned pro’s. Of course we went for pudding. You do have a second stomach for ‘sweets’ you know. Tommy, not wanting to break a habit of a lifetime, went for the Gooey Chocolate Pudding. I went for one of my favourite desserts: Affogato. I always get very excited when I see this on the menu. Yes, you could say ‘it’s just Vanilla ice cream and espresso’ but it’s not quite the same when you do it yourself. The House serve 2 scoops of ‘Seriously Real,’ Sussex vanilla ice cream in an old fashioned sundae glass, alongside a small white porcelain jug of hot strong espresso to pour on at your leisure. I like to watch the ice cream melt and merge with the coffee, making a deliciously sweet iced coffee which I drink from the glass. Restaurant or not. Like, I said, that’s the great thing about the House, you really do feel like you’re at home. As always, we left feeling extremely satisfied, relaxed and happy. We were ready to go back to our healthy homemade meals at home again. For a week or two at least anyway.